The New Mexico State University Ag Science Center is asking farmers and ranchers in Southeast New Mexico to identify their most critical needs in order to help the center plan future research projects. Nestled across the railroad tracks south of Artesia, the agriculture testing facility was the dream of farmers from Artesia, Roswell, Carlsbad and Loving – a location where crops could be tested and research developed to improve yield and production practices. This group of farmers purchased the land and water to develop the NMSU ASC-Artesia. 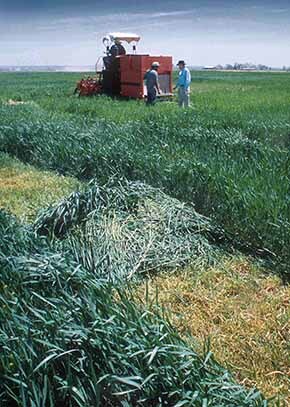 With the addition of Lea County, the farmer-led project became the Southeastern New Mexico Agricultural Research Association. A scholarship program was also established for SENM students studying agriculture at NMSU. Over the years, this research and extension station has been instrumental in water rights issues, salt cedar eradication, dairy manure management, boll weevil and pink bollworm eradication, sugarcane aphid management, soil and water test interpretations, and numerous other projects, which benefit not only clientele in SENM but across the state. “The ASC would appreciate hearing from those who have visited the center or benefited from information provided,” said ASC superintendent Dr. Robert Flynn. “Over the years, we have seen many people pass through our doors, and we would like to know what has stood out from your visit, or what projects sparked your interest. Responses may be emailed to [email protected] or submitted by phone: 748-1228. ASC-Artesia will be holding its annual Field Day at 4 p.m. Aug. 23.